We Have a Photo Winner! Congratulations to the winner of our Fall Photo Contest! 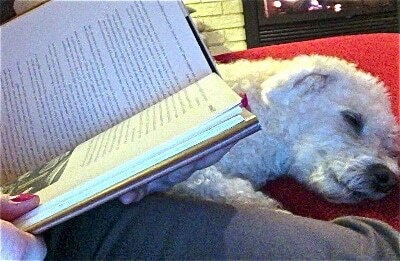 Readers Lane follower Diane snapped this adorable pic on her web cam. She loves the crisp, cool weather that comes with fall in the north country, but knows that the best way to enjoy it is in front of the fireplace with a good book and a warm puppy. Diane wins our four-book Cozy Mystery Bundle, generously provided by super-publicist Maryglenn McCombs, giving her four new series to try as the season turns from crisp to downright cold. Thanks to everyone who entered our photo contest — we loved all of your fall book themed photos! Be on the lookout for future giveaways from Readers Lane, including quite a few signed books donated by authors especially for Readers Lane followers!